Year of Manufacture: 1899. Please note that firearms must be produced in or before 1898 to qualify as Antique. This shotgun is C&R eligible, but not Antique. Markings: The top of the barrel is marked “MANUFACTURED BY THE WINCHESTER REPEATING ARMS CO. / NEW HAVEN. CONN. U.S.A. PAT. NOV. 25,90. DEC. 6, 92. JULY 21, 96. FEB. 22, 98. JUNE 14, 98”, “12 GA.” with an ovalled “WP” proof, the left is marked “FULL.”. The side of the action bar is marked “WINCHESTER / MODEL 1897”. The bottom of the barrel extension and receiver are each marked “95490” and the bottom of the receiver is also marked “C”, the top of the receiver is marked with an ovalled “WP” proof to the left of the rear sight groove. Choke: Marked Full, but our gauge measures Modified. Sights / Optics: This shotgun is mounted with a bead front sight and a shallow groove at the front of the receiver which serves as a sighting plane. The rear sight groove and the top of the receiver are finely serrated to reduce glare. Stock Configuration & Condition: The stocks are two-piece checkered walnut with straight grip, inset black diamonds on each side of the wrist, straight comb and solid brown rubber Winchester buttpad. The stocks have several scattered light compressions, bruises, scratches and scuffs. The checkering is generally well defined where not compressed, but does show smoothing from handling. The checker pattern on the wrist extends to the front edge at the receiver with the border pattern interrupted at the edge (please see photos). There are no chips or cracks. The length of pull measures 13 1/4″ from the front of the trigger to the back of the buttpad. The pad has scattered light wear and discoloration from age and oil, in about Very Good condition. The stocks rate in about Very Good overall condition as possibly not original to the gun. Bore Condition: The bore is mostly bright. There are a few patches of very light erosion scattered in the bore. Overall Condition: This shotgun retains about 70% of its metal finish. The finish is thinning at all edges. The barrel has operational wear from the slide handle and wear from disassembly with some scattered light marks, a few areas of very light finish wear and scattered very faint freckling. The barrel extension has finish wear on the top, heavier on the left, with some light marks and light surface oxidation in the wear and marks. The magazine tube shows operational wear and wear from disassembly. The receiver has a patch of marring at the front-left edge, several scattered light marks and light finish wear with discoloration from oxidation in most marks and wear. The screw heads range from sharp to tool marked with strong slots. The markings are clear. Overall, this shotgun rates in about Very Good condition. Mechanics: The action functions correctly. The trigger is crisp. We did not fire this shotgun. As with all used firearms, a thorough cleaning may be necessary to meet your maintenance standards. Our Assessment: The Winchester 1897 was designed by the famed John M. Browning and quickly became one of the most popular shotguns in the world, serving the United states military in both World Wars and popular with law enforcement agencies across the country. It should come as no surprise then, that it was also popular on the civilian market with many field guns produced. 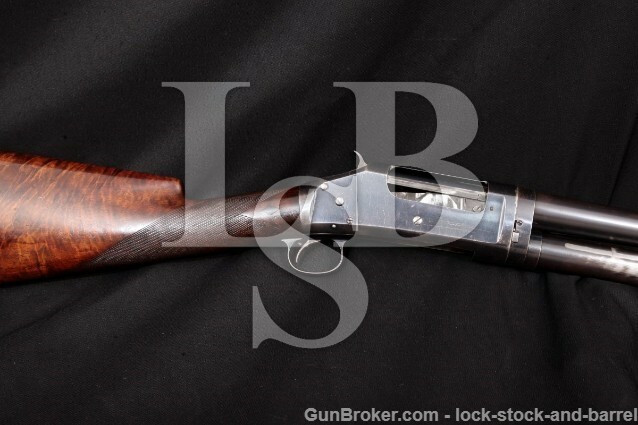 This example has gorgeous Black Diamond wood and is in great condition for a 19th century gun. Without the “TRAP GUN” marking on the bolt, it’s unclear if this is a Trap or Tournament Grade gun which has had the bolt replaced or a Field Grade gun which has had the wood replaced, but it certainly has pretty furniture! This would be a great addition to any Winchester, Shotgun, or 19th century firearm collection. Please see our photos and good luck! CA Legal or CA Private Party Transferable: This C&R eligible shotgun can be transferred in California.